Chronicle all your adventures, secret plots, and laundry lists in the Munchkin Journals! 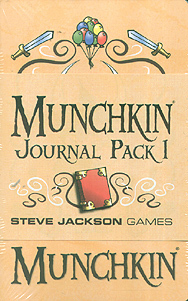 Three 48-page pocket journals, one each with covers from Munchkin, Star Munchkin, and Munchkin Cthulhu. Plus a new Munchkin card!